Boston JerkFest features live music with more than a dozen artists jamming to the tunes of reggae, soca, steel drums, world music, Caribbean rhythms, and more. 2019 Entertainment line-up coming soon. Jahriffe & JAH-N-I ROOTS MOVEMENT – Roots Band release their first album “Rastafari Love” in 2005. A ten song album of a journey and purpose which received national & international audience attention. Jahriffe, lead vocal of JAH-N-I Roots Band began opening for great reggae musicians like Kymani Marley, Anthony B, Mighty Diamonds, Midnite, while also winning 2007 Urban Music Award. By 2013 still holding strong to the inspiration births forth a second JAH-N-I Roots Band release “Check Your Timing” an album of persistence and love for creating music with reason. Receiving great welcoming to the album from the listeners songs like Empress, You Remind Me, and Bless The Seed becoming fans favorites. Alongside a 2014 performance opening for Chronixx was good promo for the release. In 2015 changes start to take place for the long standing Roots Reggae Band. Inspired for a new direction Jahriffe brings himself to the fore front as Jahriffe & JAH-N-I Roots Movement. The evolution created more vision for the task felt in the soul of Jahriffe. He becomes the voice and face of a music that defines an experience of humanity’s higher self. This metamorphoses opened up the platform to guest speaking at Mobile Alabama University which led to many lectures in the US, and closing 2015 with an energetic performance supporting Kabaka Pyramid & Iba Mahr. Jahriffe takes it straight to the roots with a single giving veneration to his spiritual foundation of The Rastafari Movement.“Rasta Can’t Fade” single released October of 2016 awaken the souls of the people accompanied with a music video receiving more than 100 thousand YouTube views and currently growing. Gaining more support from fans, “Love is One” wins best video of the year 2016 Garrison Award. Keeping a steady flow, Jahriffe was awarded from the Mayor of Boston for he’s musical contribution during his live performance featured in the sold out 2016 African Fashion Week Boston. Jahriffe welcomes 2017 with a theatrical role as, Bob Marley in the play “ Its about Time” located at the historical Strand Theatre in Boston. His desire to be apart of the change for truth, rights, love and equality for all using Reggae Music as a vehicle to send the message, is alive and well within his community and beyond. Jahriffe delivers a hopeful, compassionate, fearless, inspired performance that re-awakens the JAH-N-I Roots Movement in the mind, body, and souls of he’s audience. The success of the movement continues to grow and develop a wanted experience by many. Jahriffe stands in the place with other humanitarian of the world, feeding the inspired with more inspiration. Johnny (Fyaworks) Graham, is a very talented and diverse artist, his music is alike yet still different in its own respect; his music captivates the mind and soothes the soul with his melodic voice and heartfelt songs. He touches all subjects pertaining to life and what’s going on in the world today. Fyaworks can put his sound to any track. The name fyaworks, defines: an artistic display; the works of the fyah is always hot! The works of the Fire is love; but if you vex the fire you will get burned(musically Speaking). The fire! works, it can heal, mend broken hearts, bring joy to those feeling pain. His experience and knowledge of music, can be heard pulsating trough the speakers and swaying on the riddims. His a very positive artist; and uplifting, still he’s quick to turn over babylon corruption table. His musical moods change with each song, as you will hear, whether it be a love song, culture, dancehall, or voicing on a hip hop track, techno or soca; he’ll get it to the masses. All races and genres must hear my music says Fyah! RIDDIM SYMPHONY – Riddim Symphony is a band that was created in fall of 2016 by Berklee College of Music students who hail from various parts of the West Indies. They specialize in Soca, Calypso, and Reggae. Over the past year, they have been performing at various universities, sharing their love for their culture as well as cultivating the carnival spirit everywhere they go. They have had the privilege to even open for Konshens at northeastern this past spring! Since then they have performed for fashions shows like Boston Caribbean Fashion week and a fashion show held for Boston Carnival. DIS-N-DAT – Formed in 1999 by four time grammy nominated Black Uhuru drummer ‘Rangotan and 6 time steel pan champion Sista D, Dis-N-Dat has a unique sound, setting us apart from all the rest. 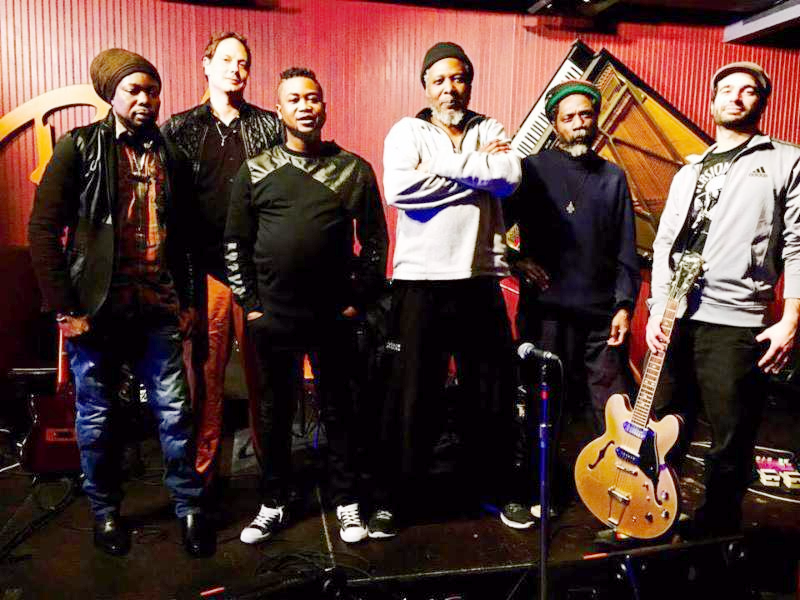 Dis-N-Dat incorporates Roots Reggae, Dance Hall and R&B in to a sound all our own known as Neo-Reggae, moving audiences all over the U.S. for almost 20 years. We take the reggae to a new level, at the same time rocking the foundation sound that so many are looking for. The band has performed at many from venues like Chelo’s Bar and Grille in Rhode Island and the Hot Tin Roof on Martha’s Vineyard to large festivals like the MOJA Arts Festival (Charleston, SC), Midwest Reggae Festival (Southbend, ID), Seabreeze Reggae Festival (Long Beach, CA), Seacrets (Ocean City, MD). Dis-N-Dat has also backed top International Reggae acts that include Queen Ifrica, Tony Rebel, Anthony B, Everton Blender, Sister Nancy and many more. Dis-N-Dat continues to blaze a trail of vibes worldwide from shows to albums. Our most recent album ‘One Perfect Love’ hit #7 in the Reggae Charts and we look forward to releasing ’Straight Up’ later this year. A Dis-N-Dat performance is an truly experience to behold. FLAWLESS night for his clients. DJ Smoov has joined forces on many occasions with well-known artists whether it was opening a concert, creating a track or providing sound reinforcement. He is also the man behind Boston’s FIRST EVER Haitian Masquerade Camp, where he made sure that an audience of over 500,000 people saw and felt the Haitian Culture as the truck/float made its way down the parade route for several years. Along with his extensive list of hosted events, DJ Smoov still manages to put out a variety of mix tapes for your personal listening pleasure.What makes DJ Smoov stand out among all other DJ’s is that DJ Smoov has a couple of degrees in Audio Technology. Not only does he have an extensive educational background in Audio and musical culture, Dj Smoov is also a respected college professor. There so much more to being a DJ than playing music. When Dj Smoov a.ka. The “The DJ Professor” is on the tables he gives his audience an experience that they will never forget.